To make the Marinade: In a small bowl whisk together the marinade ingredients with 1/4 cup water. Cut the beef into 3/4-inch cubes. Place the cubes in a large, resealable plastic bag and pour in the marinade. Press the air out of the bag and seal tightly. 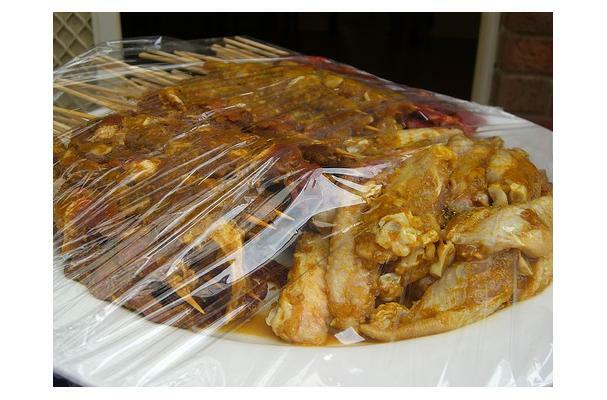 Turn the bag to distribute the marinade, place in a bowl, and refrigerate for 1 to 2 hours. Remove the meat from the bag, reserving the marinade. Thread the meat onto skewers, leaving space between the cubes. Allow to stand at room temperature for 20 to 30 minutes before grilling. Grill the beef cubes over Direct High heat until medium-rare, 3 to 5 minutes, turning once halfway through grilling time. Pour the reserved marinade into a small saucepan, bring to a boil over high heat, and boil for one full minute. Add the peanut butter, return to a boil, and whisk until the sauce thickens. Serve warm with the beef skewers. Wine Recommendation: A Pinot Noir from California"s Central Coast will open up wide to embrace these delectable beef skewers. Beer Recommendation: The beef calls for a darker beer, the chiles call for a creamy brew. A Pilsener like San Miguel Dark from the Philippines is the perfect choice. Comments: An inspired use for peanut butter.